Keeping track of all the Fossil Group smartwatches launching this year? Well you can add the Skagen Signatur T-Bar to the company's growing army of wearables. This one is actually a big deal, not only because the Danish watchmaker has been making some of our favourite hybrid smartwatches so far, but because this is the first that is actually designed for women. It's also the smallest of Skagen's hybrids featuring a 36mm watch case that measures in at 12mm thick and comes with a 16mm strap. The collection is also 3ATM water resistant, but we wouldn't suggest taking it for a dip in the pool or in the sea. The T-Bar is available in four different colours; rose gold, gold, grey and silver with mesh straps and leather straps options. 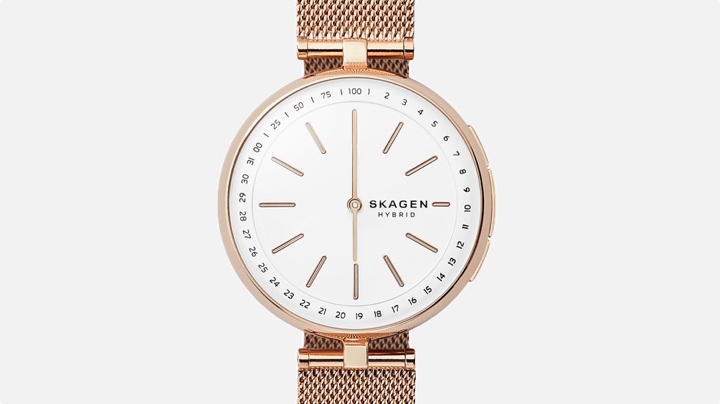 In true Skagen style, it's all about that minimalist look and playing to the design of its watches that come without the smarts. Speaking of smarts, you can expect more of the same connected features we've seen on Fossil hybrids so far including discreet notifications for texts, calls and emails with activity and sleep tracking also in tow. You can also take control of your music or take a photo using the physical button on the side of the watch. It's Android and iOS-friendly like the rest of the Skagen hybrid collection and there's no need to worry about charging it for a while because they are all powered by a standard CR2025 coin-cell battery that is replaceable. All of the Skagen T-Bar Hybrid smartwatches are available now from Skagen's website for $195, which means it's similarly priced to Skagen's Jorn collection and still makes it a pretty affordable option to get some smarts on your wrist.